Like many others, I watched the events that unfolded in Parkland Florida with heartache and horror. 17 young lives snatched away in a few tragic moments to yet more gun violence. Sadly, I also watched it with despair, knowing that this has happened so many times before and will likely happen many times again. And then Emma Gonzalez, David Hogg and their friends emerged from the carnage and found their voices. Voices that have rung true and strong. Voices that shout ,“Never Again”. Voices of youth who refuse to be silenced in the US and around the world. I was moved to tears by the six minutes of silence that Emma shared as she spoke at the Washington March For Our Lives. [i] Six minutes that showed the short amount of time that allowed the horror to unfold. But six minutes that also showed the passion of a new generation. Many of us have been expecting that passion to erupt for a while. We felt there might be some trigger that would explode the pent-up desire that this generation has to change the world, to be voices of reason in an insane culture and to say enough is enough. Gun violence was that trigger but that voice is emerging in so many other spheres as well. Environmental activism, the #metoo campaign, standing with Aboriginal brothers and sisters and so much more besides. 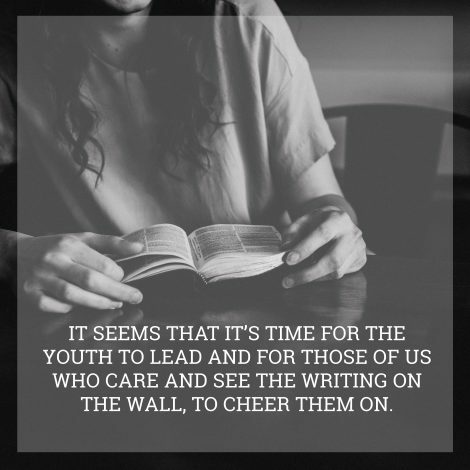 It seems that it’s time for the youth to lead and for those of us who care and see the writing on the wall, to cheer them on. The reason why JustUs was established was for such a time as this. Since we were founded, we’ve been saying that young people are passionate about justice and change. And that those of them who are Christians just aren’t prepared to sit back and watch their secular brothers and sisters sing the songs of change that they believe should be sung loudest by Christians. They know that our faith is a revolutionary upside down one, where we stand with the voiceless and oppressed, the refugee and the abused woman, the child cowering under the desk from an automatic rifle or running from a chemical weapons attack. They know that the colonization of all that we stood for by those with a fixation on political power at the expense of a Biblically defined Christ like-faith has stolen our inheritance. And they want it back. We have seen the stats and heard the stories of youth hemorrhaging[ii] out of church because they are not being listened to, because a message without deeds has no relevance to them when they see the mess the world is in. There is only one way to turn this around and it’s not by shouting louder or finding the points to disagree on. Instead, it’s time for the church to listen and to understand that to both reach and empower this generation, we must fully embrace their passion and their new way of thinking and doing things. And here are five things the church can to do to make this happen. Embrace the passion of young people and do all we can to stand with them and see it released. Walk and learn together across the generations as we attempt to understand the intrinsic connection between the evangelistic call and God’s heart for the poor and oppressed. Move away from standing with specific political power and authority structures and embrace a Kingdom-based way of being. Reengage with what it means to be Christ-like servants in a world that we can no longer talk down to from the safety of our pulpits. Understand that the church is no longer at the center of the public square and embrace holistic cross-cultural mission in our home towns. If we don’t respond, it’s highly likely that we will continue to see youth engagement in the established church decline. But even more importantly, we’ll miss the chance for the church to recapture the essential essence of what it is called to be, a body that stands with all and specifically includes the most marginalized as it sings its liberation song to those who most need to hear it.